Spray doughnut pan lightly with non-stick cooking spray and set aside. In a large bowl, whisk together melted butter, buttermilk and egg. Set aside. In a medium bowl, whisk together cake flour, sugar, baking powder, nutmeg, orange zest and salt. Pour dry ingredients into the wet ingredients and stir to combine. Spoon batter into doughnut pan wells so they’re about two-thirds of the way full. Bake for 8-12 minutes, or until the tops of the doughnuts spring back when lightly touched. Allow to cool in pan for a minute or two, then turn out onto a cooling rack with wax paper underneath and cool completely. To make the glaze: Microwave all glaze ingredients in a shallow bowl for 10 seconds at a time, stirring between, until melted. Dip cooled doughnuts into the glaze (or spoon it over the doughnuts) and return to cooling rack to dry. Doughnuts are best served the day they are made. I’m not a doctor – in fact, most doctor’s offices and clinics and medicines and such kind of skeeve me out. But if I were a doctor, I’d be really good at curing things like heartaches, homesickness and overall no good, very bad days. Why, do you ask? In a word: Doughnuts. Doughnuts make everything better. Seriously, Ever. Y. Thing. Think about it – what is one situation when a doughnut would not make you happy? OK, probably when you’re actually sick, but that’s neither here nor there (and also why I’m not actually and never will be a doctor – I’m leaving the real medicinal cures to the husband, who is going to be a physician assistant in a few short months. I just bake the doughnuts). What’s important here is that when you’ve got an ache that no prescription can cure, doughnuts are almost always the answer (or, more cowbell). 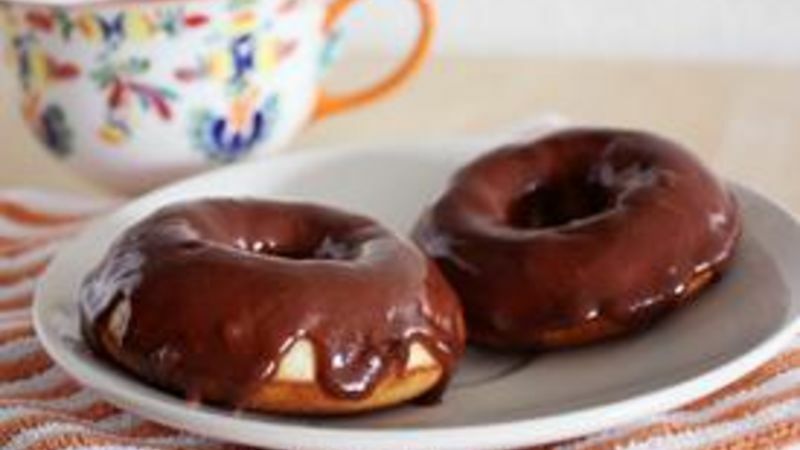 These Orange Buttermilk Cake Doughnuts with Chocolate-Orange Glaze are one such example. When I was having a horrible, no-good very bad day a few months ago (think new necklace breakage, coffee spillage, a few dinner failures in a row…), I gave myself a good old-fashioned pep talk, preheated the oven and got to baking this creation. Let me tell you – it was a miracle cure. A few bites and then a few doughnuts later and I was a new person. Maybe it was the fluffy texture and citrus-kissed flavor of the cakey doughnuts. Maybe it was the gooey, bittersweet dark chocolate glaze. Whatever it was, I was convinced from that day forward that nothing can surpass the strength of a good doughnut on a bad day. If you don’t have a doughnut pan, fortunately or unfortunately, for this recipe you’ll need to get one. The good news is they’re super easy to find and super inexpensive. All you need is a little bit of room in your kitchen cabinet and an undying wish for doughnuts. Whether you’re feeling crummy or simply have a hankering for something sweet, these doughnuts will guarantee a happier day.